French Connection is one of my favorite destinations for dresses. A lot of them are wearable anywhere, anytime – take this one. The print works year round and so does the fabric. 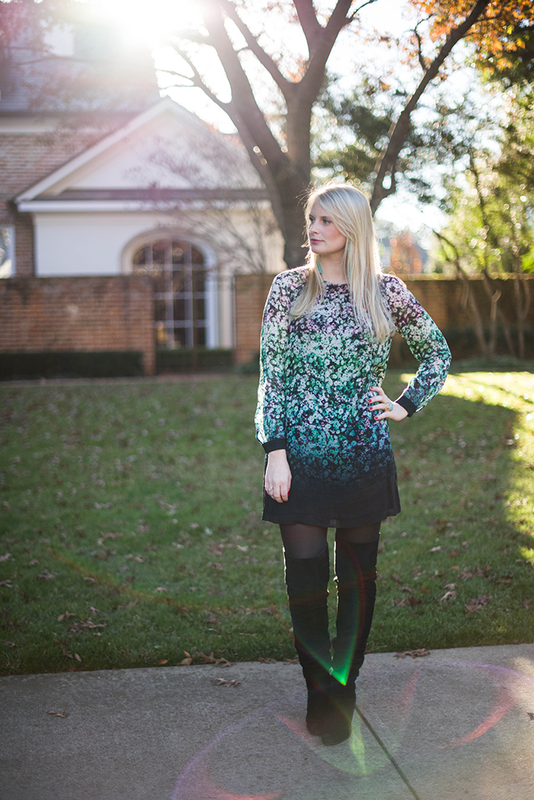 The dress is light enough to wear in summer, but the long sleeves make it appropriate for winter too! 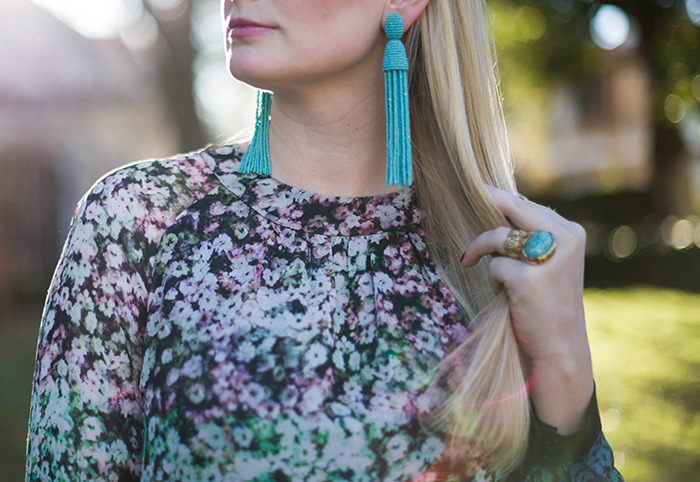 Here I’ve paired it with my favorite over-the-knee boots by Stuart Weitzman and some turquoise jewels to bring out the aqua shades in the dress – isn’t it a wonderful day-to-night look? In the spring I plan to wear the dress with heeled sandals for a night out ensemble. This dress is also available in a longer, sleeveless version which is also drop-dead gorgeous (and the dress on sale!). The color scheme goes with so many different accessories in my closet. Love! 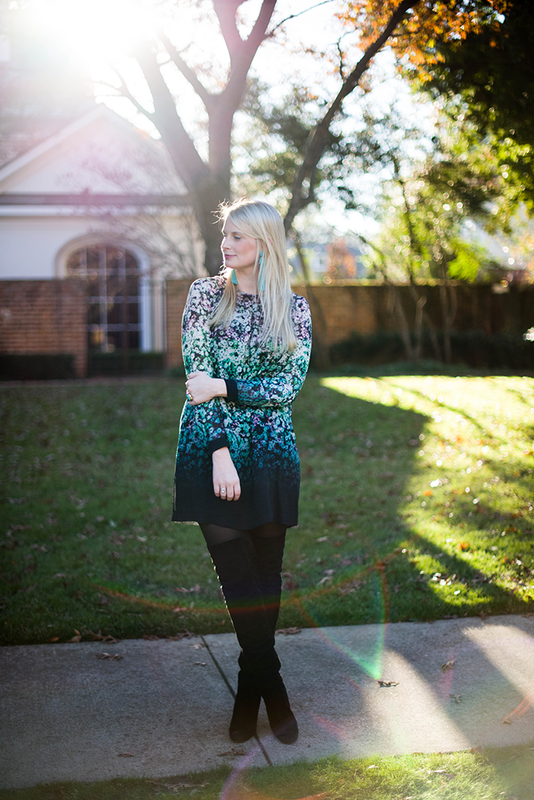 Check back next week to see how I’ve styled my New Year’s Eve look with this sparkly number. PS – have you had a chance to rediscover my new shop? It features the latest and greatest of my favorite products from fashion, beauty and home. Click here to get started and click through the category you want to shop my recommendations! That dress is so gorgeous and I am obsessed with your earrings. So pretty. That dress is absolutely gorgeous, ah I love it! You look fabulous! 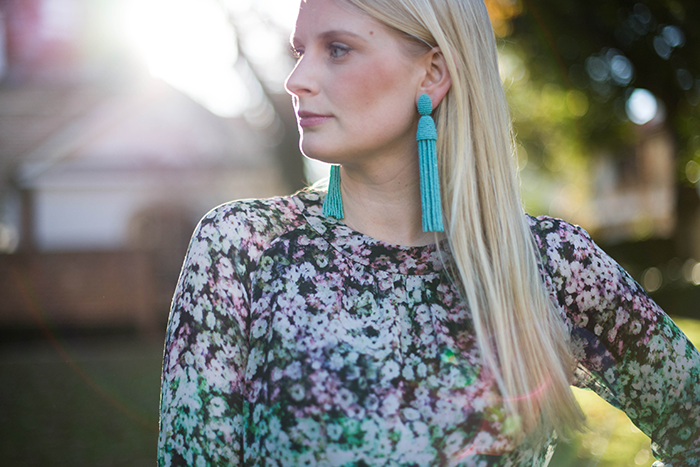 Those earrings are pretty amazing as well – the perfect statement! 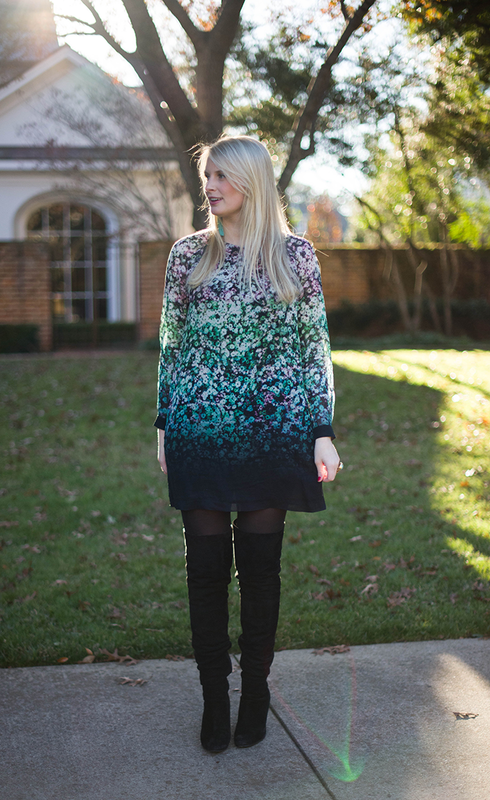 This dress is such a beautiful print + I love those over-the-knee boots! 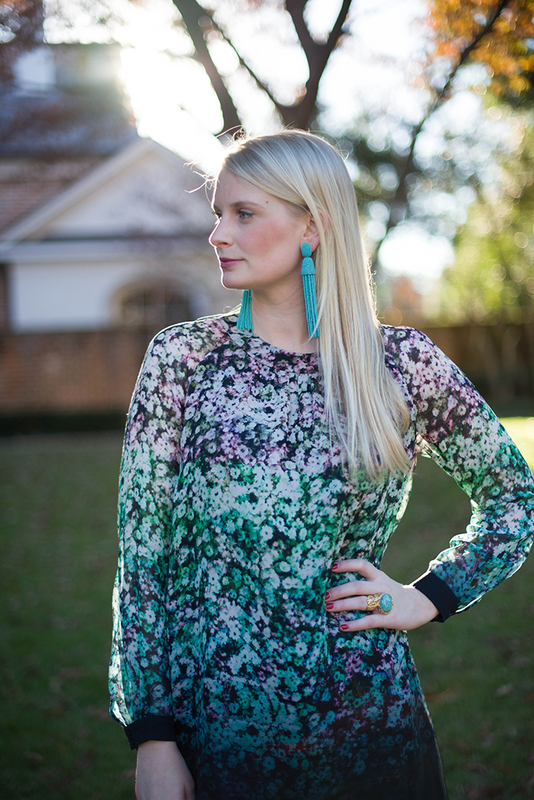 Love this dress on you, but the earrings are beyond! Those boots are the perfect compliment to that dress! Love it! Such a beautiful dress! I love the gradation at the bottom, so unique and pretty. Loving the color palette in this look! I absolutely love the dresses of French Connection, but often find them too short. Voila with your tights, it looks great and conservative! I’m OBSESSED with this print. It’s very Mary Katrantzou, but actually within reach! And those OTK boots…LOVE. 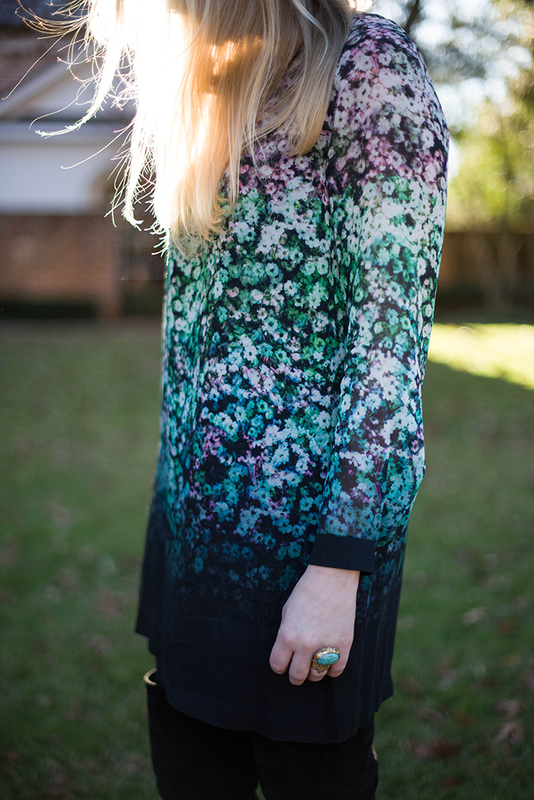 The color and print on this dress is astonishing. I love how you added all the teal jewelry, it looks amazing and it compliments the dress. That dress is gorgeous! I’m so jealous of your non-snowy photos! This dress is perfect! It looks great on you! I like French Connection and Club Monaco for dresses too. That dress is gorgeous! Love French Connection. And those boots are killer! now I’m eyeing an arty ring again. love them! This may be the dress I get next week when I go to French Connection! 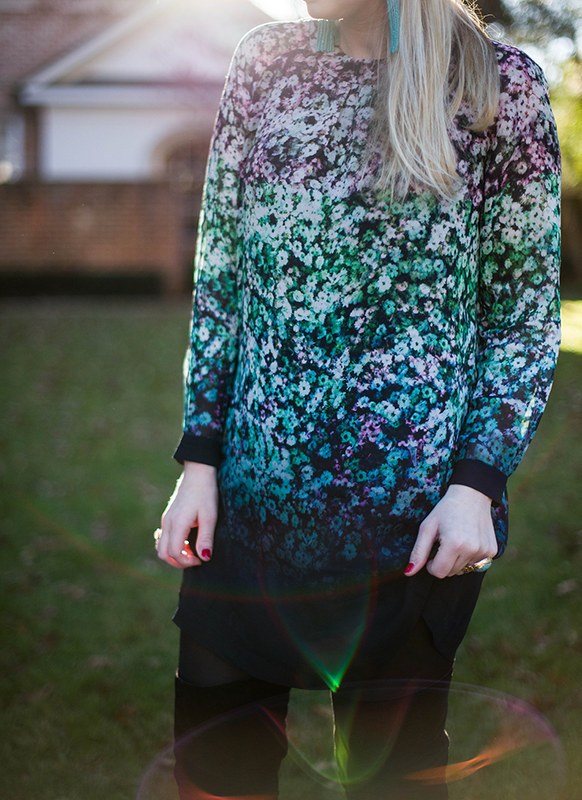 Obsessed with the beautiful print! The dress!! so romantic…I love the colors. French Connection really surprises me sometimes. The photos are lovely too! Adore those earrings. This dress is absolutely gorgeous, and I love the earrings! !